Lieutenant Martin killed in Japan, 1961. Caption slip reads: "Photographer: Swaim. Date: 1961-03-16. Reporter: Swaim. Assignment: Lt. Martin and family. 31/35: (Copy negs) Lieut. 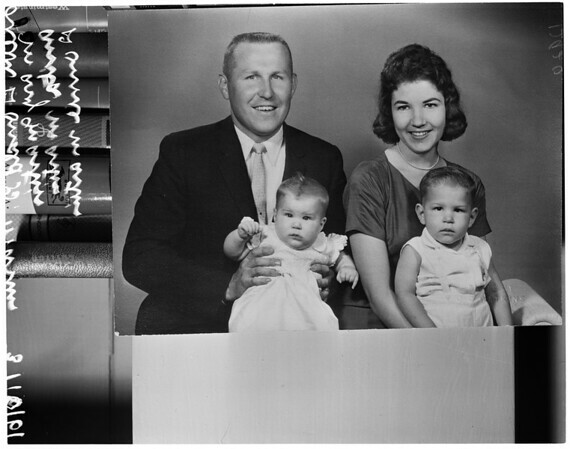 Donald G. Martin, USAF, killed in Japan, with his family, wife, Mary and children, Anita, 13 mo. (left) and Donnie Douglas, 27 mm. ".